A survey recently launched by one EU-funded tourism development program revealed that a mere 6% of the questioned international tourists choose to return to Vietnam due to poor tourism services, inconvenient transport and inadequate investment. The survey, launched by the Management Board of the EU-funded Environmentally and Socially Responsible Tourism Capacity Development Program (EU Project in short), also showed that over 90% of the international respondents are first-time visitors. The survey was launched in five of the country’s major tourist attractions: Sa Pa town in Lao Cai Province, UNESCO-recognized Ha Long Bay in Quang Ninh Province in northern Vietnam, Hue- the country’s imperial capital which is home to UNESCO-recognized monument complex, Da Nang and Quang Nam Province’s UNESCO-acclaimed Hoi An Old Town in the central region. The respondents were some 3,000 domestic and international tourists touring at the five mentioned spots in March and April, and July and August. Hoi An and Da Nang boast longer tourist stays than Sa Pa, Hue and Ha Long Bay, according to the survey. Tourists stay in Da Nang and Hoi An on an average of almost 4.5 nights, while they only spend 1.5-2.5 nights in Hue, Sa Pa and Ha Long. The survey also pointed out that among the questioned domestic tourists, 39%, 24% and a mere 13% are on their first, second and third visits to the sites. A number of tourism experts and tour guides told Tuoi Tre (Youth) Newspaper that the survey results reflect quite precisely the current Vietnamese tourism, which is endowed with stunning landscapes, but is plagued by inadequate investment, scanty tourism services and difficult transport. Nina Walker and Julian Roopp, two German young tourists, spent almost 30 days travelling from the northern region to Ho Chi Minh City on their first visit to Vietnam. They shared that the more they traveled southward, the fewer unique Asian features they could find in the sites, except for a hot humid climate. “HCMC is nice and modern but its lack of typical Asian architecture makes it look just like any other modern city in the world. We didn’t know where to go for traditional Vietnamese art performances in the evening,” they said. Similarly, Amyna and Fatou, from France, found buying purely Vietnamese souvenirs a real challenge on their first visit to the country. Many souvenirs look just like those found in Thailand or China, they added. The four young foreigners all shook their heads when asked if they would return to Vietnam. These were among the many foreigners Tuoi Tre reporters met at the Notre Dame Cathedral and HCMC Central Post Office- two of the city’s most-frequented spots- where the newspaper launched a mini survey. According to Tuoi Tre findings, most of the respondents replied that they wouldn’t come back to Vietnam as the spots’ appeal remains limited. Carlo Campisrn, an Italian tourist, and his girlfriend were about to complete their first visit to Vietnam after four weeks travelling to Sa Pa, Hanoi, Ha Long Bay, Hue, Hoi An and HCMC. “I haven’t thought about revisiting Vietnam. Your country’s landscapes are really gorgeous but seriously polluted. Garbage is pervasive in Ha Long Bay and Hanoi streets,” Campisrn commented. He pointed out that in Venice, one of the world’s famed tourist attractions, the tourism authorities there always make sure that tourists are pampered and provided with adequate information and services. By contrast, Vietnam boasts a large number of relics and scenic spots, which aren’t appealing enough due to improper investment to draw second-time visitors, he stressed. “We were often pestered by peddlers, who tried their best to talk us into buying their items. We and other tourists who don’t go in tours also found traveling from one place to another by public means of transport a challenge due to lack of information,” he complained. A veteran officer at one of the country’s major international tour operators, acknowledged that international tourists’ unwillingness to return to Vietnam is put down to monotonous services and products. “Our tourism industry lags far behind other Southeast Asian countries, let alone other developed ones. Thailand launches five to 10 new spots each year, while Vietnamese attractions remain almost unchanged for several years,” he noted. Thanh, a tour guide at a company in HCMC, said that his company always tries to add seeming novelty and diversity to their tours to draw clients. His company launches sightseeing tours on “xich lo” (pedicabs) and bicycles within Hoi An Old Town to avoid boredom. He added that while the quality remains almost unchanged, increased admission fees, such as the planned 30% rise in fees to Hue’s monuments, and doubled fees to Ha Long Bay, have further deterred tourists from returning. According to local tour operators, inbound tours from European countries vary from US$900 to over 1,000 for a tour of nine or ten days depending on the itinerary and hotel quality. Most international tourists come to Vietnam for only sightseeing and exploration of the native culture. By contrast, other countries also combine sightseeing, culture discovery with diverse shopping and recreational activities, considerably boosting their chance of coming back. Tran Xuan Hung, CEO of Viking, a local tour operator, said that his greatest headache is to guide international tourists, particularly those from Islamic countries, where to go for recreation and shopping at night. “The major shopping mall complexes in HCMC aren’t by no means on par with similar venues in their countries, while pure Vietnamese souvenirs and traditional art performances are really hard to come by,” he noted. 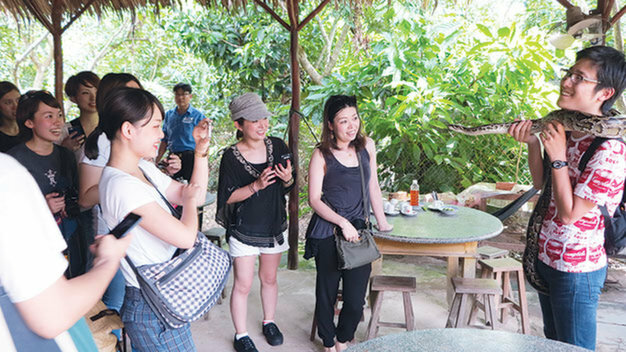 Ngo Thanh Phong, a tour guide at major tour operator Saigontourist, stressed that many international tourists on tours to the Mekong Delta said they would certainly prolong their stay if transport to the places was easier. The Singapore Tourism Board (STB) recently reported that more than 380,000 Vietnamese holidaymakers traveled to Singapore in 2013, a four percent increase from 2012. These tourists have contributed US$616 million to Singapore’s tourism industry, the STB said. In the first eight months of this year alone, 303,000 Vietnamese tourists have traveled to the island country, a 14 percent year on year spike, according to the latest STB statistics. In 2013, up to 52% of Vietnamese holidaymakers returned to Singapore, and only 48% of them were on their first visit to the island country. 59% and 41% of tourists from other countries are first and second-time holidaymakers respectively.